Maintaining mobility, muscle tone and hand-eye coordination is an important aspect of dementia care. This "Active" module includes three activities that can be used with little preparation or setup to offer fun and stimulating exercise programs. Use them in conjunction with yoga, chair exercise and other active programs to fill out your exercise program. Making Waves small group program is a great way for three to six dementia patients to exercise their arms and upper body while having fun. Sitting in a small circle, each participant grabs a handle or two on the small, six foot parachute and start making waves. 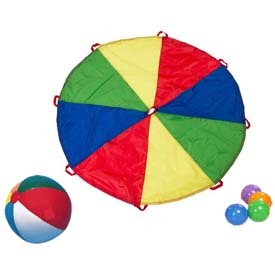 Throw a ball onto the 'chute and bounce it, roll it and keep it moving without dropping. Add more balls for more challenge and fun. It's a great upper body and arm exercise, helps with dexterity and coordination and is lots of fun! Simple, fun, engaging. 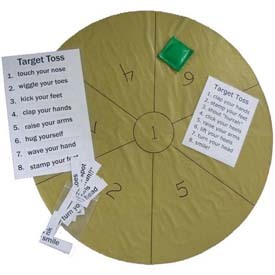 Target Toss is a fast and easy way to involve one to six residents with dementia or Alzheimer's in an "active" program that encourages movement and exercise while having fun. Choose from the provided action cards, make up your own or use the pre-selected action list. Toss the bean bag towards the target and everyone does the action indicated by the number hit. Miss the target? That's ok, there's an action for that too. No winners or losers, everyone participates. This simple "active" program is a great way to offer a fun and easy program that exercises range of motion, flexibility and stretching. Simply walk up to a seated resident and ask the person if they are ready to catch the ball. If they are, let the fun begin. 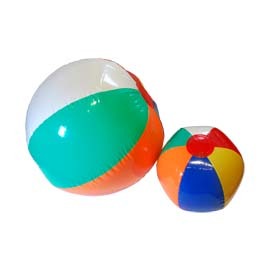 The activity includes two different sized inflatable balls to suit the abilities of different residents.